White mesh badminton nets are available in two standard widths which are ideal for singles (20ft) and doubles (24ft) courts. They are finished with a reinforced 3mm braid on the bottom and sides and come complete with a white band across the top. These nets are incredibly durable and ideal for singles and doubles badminton matches at home, schools, gyms and sports clubs. 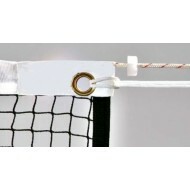 This net is suitable for badminton tournaments. The net is finished with a reinforced 3mm braid on t..